Thanks to an ambitious and spectacular lighting design by Ross Chapple for Eric Prydz’ headline slot in the Steel Yard, closing Creamfields 2018 on the Sunday evening, 144 x Kinesys variable speed chain hoists were utilised enabling Kinesys to establish a brand new personal world record! This is believed to be the greatest number of Kinesys variable speed chain hoists used – to date – for a single installation! Creamfields is the UK’s largest and most popular dance festival and the 10,000 capacity Steel Yard was their main indoor venue. 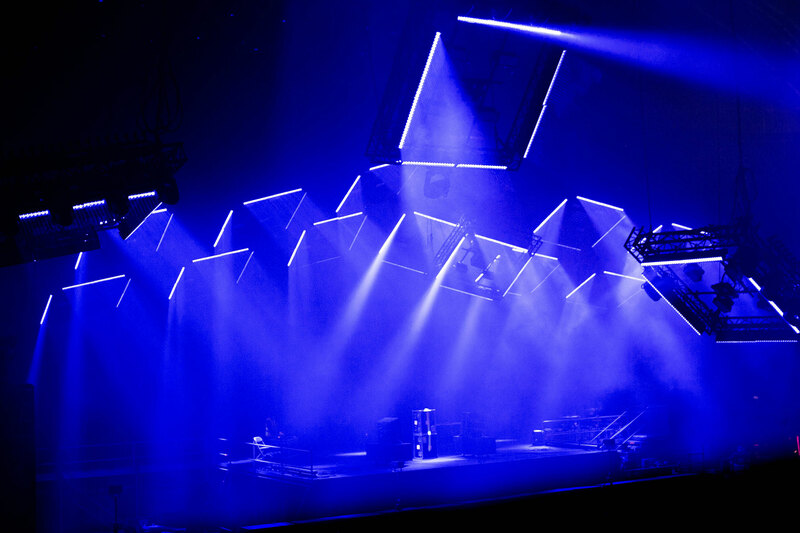 The design was based around 36 x 2-metre square trussing pods – 12 above the stage and 24 over the audience – all of them flown on four half-tonne Kinesys motors running with Elevation 1+ drives. Prydz’ live shows are well known for their dynamic and eye-catching production designs, and the creative impetus for the artist’s ‘Pryda’ curated Sunday evening was to have a fluid and never-predictable design which could physically change the architecture and shape of the space. The pods were required to tilt and pitch in all directions on all axes, and the four motors / Elevation 1+’s specifically offered this degree of flexibility to each one. PRG’s head of event services Rich Gorrod project managed the installation, working with a highly skilled crew including Pete Macdonald, Dave Evans, Mark England and Jarag Zajag, all experts in automation systems. Also closely involved was Ian Greenway of technical production management specialist LarMac LIVE, the company responsible for technical production across all stages at the festival. He further commented that “Kinesys motors are incredibly easy to rig and rock solid reliable,” a must when dealing with an event of this profile and scale. Each of the over-stage pods was rigged with eight GLP Impression X4 Bar 20 LED battens and four JDC1 LED strobe / floods, together with a 25-channel Chromalech Jarag-5 fixture in the centre. With the Steel Yard being a substantial 50 metres wide by 120 long with around 18 metres of headroom, the 24 pods in the house were loaded with that same lighting kit, plus four Robe Pointe multi-functional moving lights, one Martin MAC Viper profile and a Chauvet STRIKE4 LED 4-lite blinder. In total, there were over 1000 lighting fixtures across the full Steel Yard rig! The Kinesys motors, powered by six Kinesys Array PD-ESs, provided up to 125A of emergency-stop switched power each, all protected by adjustable RCDs. Front end control was via two Kinesys Vector computers, one dealing with 12 pods and 48 hoists over the stage, operated by Pete Macdonald, and the other running 24 pods and 96 hoists above the audience, operated by Dave Evans. To ensure that everything was safety and securely installed, Rich and the PRG team designed a dual mothergrid design for over the stage and then installed 12 separate mothergrids above the audience, all made out of 52 cm trussing. These consumed 158 sections of 3 metre Prolyte truss and over 100 x 1 tonne hoists alone, all separately hung. The automated pods – constructed from 144 x 2 metre trusses and 144 corner blocks – were all sub-hung from these mothergrids to spread the load. All cables (socapex, data and separate power / data feeds for a laser system supplied by BPM SFX were run neatly and efficiently along the mothergrid trussing to the pods. Ahead of the event Rich and the crew spent three days in the yard prepping and addressing the motors for the installation. They loaded the rigging in on the Monday before Creamfields opened, giving them only two days to build. Programming sessions started on Thursday, with PRG also supplying all the Steel Yard’s lighting and video equipment (delivered to site in nine artics)! Challenges included dealing with the undulating topography that characterises the Steel Yard at Creamfields, so plenty of energy is needed to manoeuvre flightcases. There’s also a 6-metre height differential from one end to the other to take into consideration. Kinesys’ Dave Weatherhead commented, “Creamfields is arguably THE best known and most talked-about dance event in the UK, and it is fantastic that artists like Eric Prydz and his creative team are committed to delivering such high production values to their fans. In turn, we are very proud of the fact that that Rich and his highly experienced crew chose Kinesys to facilitate this, making it a record-breaking Kinesys moment!”.